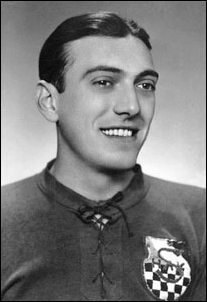 Ivan 'Ico' Hitrec (April 13, 1911 – 1946) is widely considered as the greatest Croatian football player before World War II. Hitrec was also a goal-scorer for the Kingdom of Yugoslavia national team. He appeared in 14 international games and scored 9 goals in 7 of them. He was one of seven Croatian players to boycott the Yugoslavian national team at the 1930. FIFA World Cup after the Football Association of Yugoslavia was moved from Zagreb to Belgrade. He was also the first technical officer and in his office in the Zagreb power-works in Gundulićeva street, the best players from Građanski met and discussed forming a new club with blue shirts which later became Dinamo Zagreb. Hitrec was quoted as saying that he didn't like to perform 11m penalty kicks because they were "too close" (to the goal). He was able to sprint 100 meters in under 12 seconds which was quite fast given that the fastest sprinter at the time Jesse Owens ran the 100-meter dash in 10.30 seconds.